Good recipes have roots in the most unexpected places. Standing on the sidelines of a lacrosse game last year, the grandmother of my son’s good buddy and teammate mentioned a seasonal recipe she likes to make for family and friends every spring. She had an inkling that my readers would love this easy-to-make, hard-to-resist treat and noted that it makes a lovely holiday gift. So I considered it a very good mail day when, nearly a year later, I found her recipe for chocolate caramel matzo brittle tucked in an envelope thoughtfully sent from her winter stay in Florida. 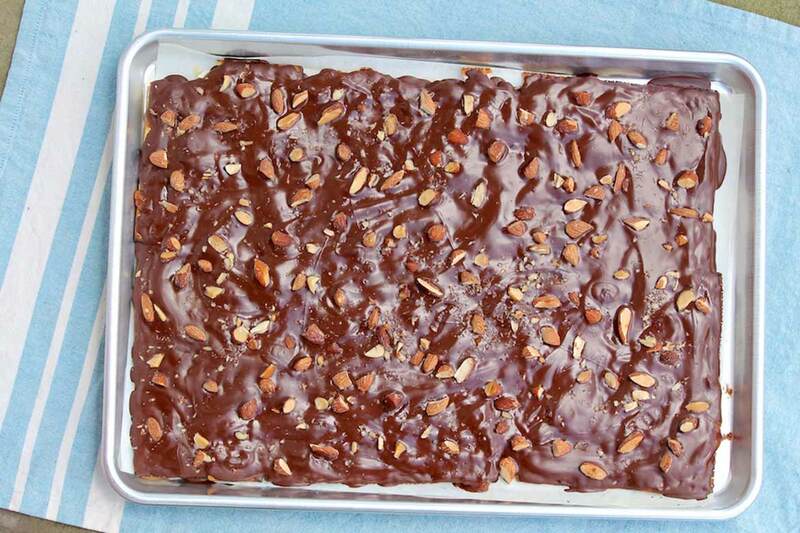 A popular Passover dessert, this chocolate toffee candy is reminiscent of a Heath Bar, except it starts with matzo. The unleavened, cracker-like bread provides a crunchy, flaky base for a layer of buttery caramel and melted dark chocolate. A sprinkle of chopped almonds supplies a second wave of crunch and a hint of salt complements the sweet notes. Curious to see if this recipe did, in fact, meet kosher standards, I ran it by Patti Spencer, a local attorney, fabulous cook, and author of several kosher cookbooks. She emphasized that the separation of meat and milk is an important part of following the kosher laws . Accordingly, meat and dairy products shouldn’t be eaten together at the same meal. For most Jews, the custom is to wait six hours after eating meat before consuming dairy. Patti further noted that the rule regarding separation of meat and milk applies all year round, not just at Passover. “Pareve” food encompasses items that are neither meat nor dairy, such as vegetables, flour, sugar, kosher fish, eggs, nuts, and fruits. They can be combined freely with meat or dairy. For those who follow a kosher diet and wish to serve this matzo brittle for dessert after a meal including meat, Patti recommends substituting margarine for the butter and using non-dairy chocolate chips–or simply enjoy it as a snack another time. When I mentioned to Patti that I had not tried this recipe with margarine and questioned how well it would stack up, she replied that she has always made it with margarine and never butter. While neither of us could compare, we both thought our versions were delicious. Patti explained that Jews who keep kosher frequently substitute margarine for butter. As a helpful note, she pointed out that margarine often contains dairy products; she always uses Fleishman’s unsalted margarine, which is pareve. Rest assured if the inclusion of vinegar is cause for some skepticism. I, too, was dubious at first, but its inherent tang isn’t noticeable. Instead, it adds depth of flavor and balances the sweetness of the caramel. Sweet, salty, and crunchy, this traditional Passover treat will be a crowdpleaser any time of year! Line a large baking sheet (11” x 15” or similar size) with aluminum foil or parchment paper; if using foil, lightly coat it with nonstick cooking spray. Arrange the matzo in a single layer, breaking into pieces to fit as needed. In large microwave-safe bowl (I use a quart-size Pyrex measuring cup), microwave the butter on high for 1 minute or until melted. Whisk in the granulated sugar, brown sugar, vanilla, and vinegar. Microwave on high, uncovered, for 6 minutes, stopping to whisk well every 2 minutes. Microwave 3 minutes more or until dark amber (or until a quick-read or candy thermometer registers 320 degrees F). Carefully remove the caramel from the microwave. Pour over the arranged matzo and spread into an even layer. Let cool for 15 minutes or until the caramel hardens completely. Meanwhile, melt the chocolate in a microwave-safe bowl for 1 minute. Stir. Heat in additional 30-second intervals, stirring after each one, until smooth. 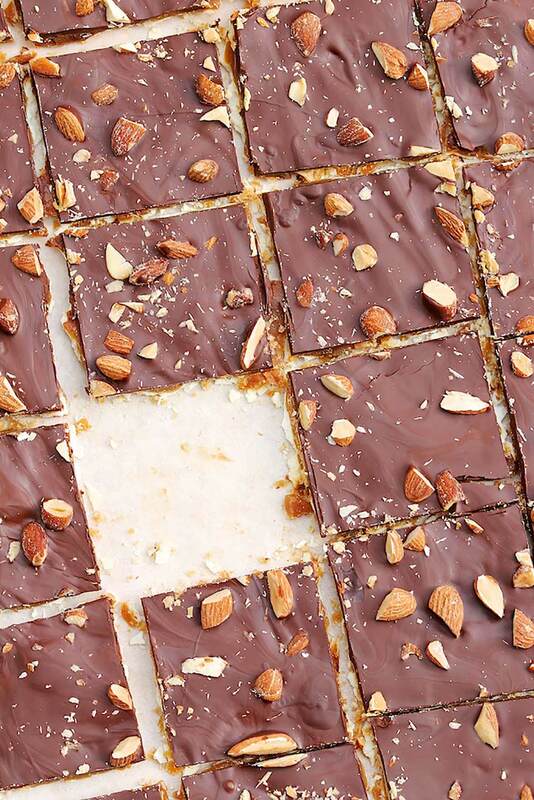 Pour over the caramel layer, spreading evenly, and then sprinkle with the chopped almonds. For those with a nut allergy, you could experiment with another topping such as chocolate or peanut butter chips, chopped pretzels, sunflower or pumpkin seeds, or even a light sprinkle of sea salt. 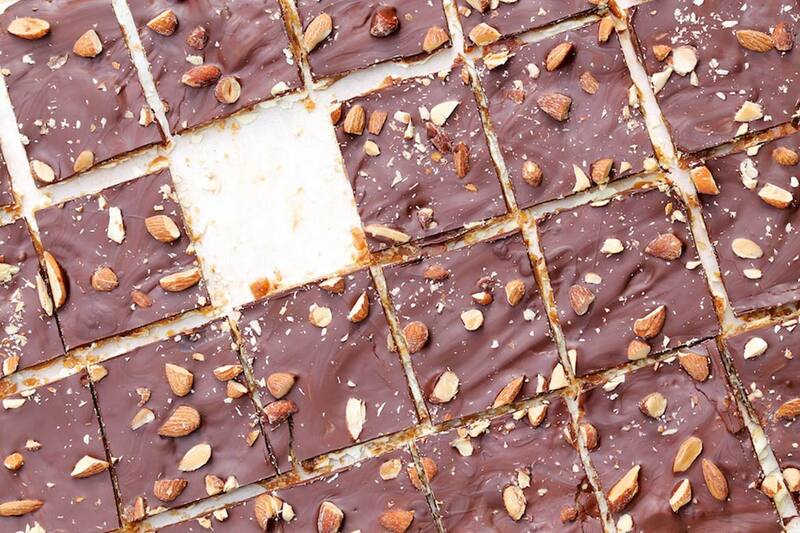 Simply lay the matzo on a large baking sheet and spread the caramel and chocolate mixtures overtop, cooling each layer before proceeding. Sweet, salty, and crunchy, this traditional Passover treat is a crowdpleaser any time of year! YUM, YUM, YUM! Made this with my daughter for a weekend kitchen project and it is disappearing very quickly! Great news, Kate. So happy it was a well-liked project!